One major aspect that differentiates marketing people from sales people is their mindset. The mindset with which marketing people understand the target market, bring a product into the market and delight a consumer is entirely different from the sales people. Sales mindset is all about figuring out how to find a customer and persuade him to buy the product. Marketing mindset on the other hand, focuses more on building relationship with the customer so that he shows genuine interest in doing business. Though the final goal of marketing and sales activities is almost the same – to make the customer buy the product, the mindset with which they approach the customer decides whether or not the customer comes back to do the business again – this is what required to run a business successfully in the long run. To better understand the difference between marketing mindset and sales mindset, we picked up few businesses whose actions talk about the type of mindset with which they do their business. Waiter at restaurant with sales mindset: It’s quite common for us to see waiters at restaurants saying “anything else, anything else”, even before we finish our meal. They will keep on asking “would you like to have desert, ice cream or cool drinks” while we are still having food. It’s purely a sales call – an intention to make customers order as much as they can to enhance the sales. This kind of mindset definitely leaves a customer with a bad experience making him not to visit the restaurant again. Bike mechanic with sales mindset: A mechanic with sales mindset tries to convince the customer to replace the parts that are not yet completely worn out. Here, the mechanic’s focus is on selling the product, but not on providing good service to his customer. Once the customer realizes that it was a bad service, he never visits nor suggests the mechanic to anyone. Restaurants with sales mindset: In general, many restaurants never try to create their own image by offering dishes which they are specialised at. Whenever, we ask them what is good at your place, the waiters tend to say something based on the customer’s tastes or preferences. For instance, if the customer is a South Indian he tends to say “Idli sambar is good”, if he is from North India he says, “tandoori naan or roti is good”. But he neither maintains nor reveals what the restaurant is good with i.e., their niche. This is purely a sales mindset. Having a sales mindset may help few achieve instant success, but they can be successful in the long run only when they make their customer happy with their service – possible only by having marketing mindset. The famous marketing guru, Philip Kotler rightly says – it is important to do what is strategically right than what is immediately profitable. Marketing mindset of local government at tourist places: Local government at tourist places asks the shopkeepers, taxi drivers, vendors, etc., in and around the popular places not to cheat the tourists. They make sincere requests and also keep a check on their activities/behaviours in order to make sure that the tourists from other states or countries have better experience visiting the place. Such practices may not increase the tourism revenues instantly but make the visitors come to the place again. This is what a marketing mindset is all about. Mirchies and pakodas are the favourite evening snacks for many of us. By observing simple things, we can easily find the mindset of the shopkeeper. Mirchi sellers who are concerned about the quality of user experience will regularly change the oil which is used for deep frying. Those who care less about the health of their customers, who focus on day’s sale rather than customer satisfaction, will use the same oil again and again. We can find a few food corners/tea stalls that provide quality food along with the best service. Their intention to serve best to the customer will be clearly visible in some acts like keeping the spoons and tea cups in the boiling water. Such acts show the business owner’s concern towards his customer’s health and how important his customer is to him. The moment we find him paying attention to small things like that we will get a sense of importance and the next time we will not hesitate to visit or refer that place to friends. That’s how marketing works – creates a long run relationship with the customer and makes him loyal. When will a customer values a product? Only when he feels that his needs were answered by the product and when he is being cared with the service offered by the company. Companies that take care of their customers will have standards of performance. They define main standards and stick to them no matter in which situation they are in. For some customers they may provide service which is above their standards but they never reduce their standards to make more money. Take for example, Apple – it never compromised on its quality. It just focused on what tech-savvy generation is looking for. It never talks about what its products can do; it’s always about what consumers can do with its products. This kind of customer centric attitude creates continues excitement among its users and every time a new Apple product hits the market, people stand in queues to get one. By providing the right kind of products customers are looking for, the company shows them how much it cares for their customers. By taking care of its customers, Apple became a $624 billion (34 lakh crore) worth company. All we want to tell is that to be successful, you need to have a marketing mindset. A mindset that enables you to do things that are really necessary for your customers. Having marketing mindset is just not limited to a business, it can be applied to any work we do. Doing work with targeted audiences/end users in mind and making the work viable under any circumstances helps us achieve success. Even sales people can adopt a marketing mindset to build strong relationships with customers – eventually gain valuable customers for the organisation. 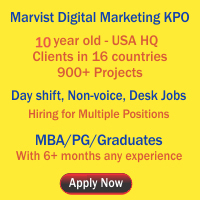 This entry was posted on Jul 2012 at 3:13 PM	and is filed under Marketing Jobs in Hyderabad > MBA Marketing Jobs > SEO Jobs. You can follow any responses to this entry through the RSS 2.0 feed. Your Feedback Matters!